These days, giving a photo frame for any occasion can be considered a crime. One might not say it outright, but photo frames as gifts are too old school. They no longer evoke that jovial feeling as they did in the past. Framed tapestries, however, will have the opposite effect. One of the elements that make a gift special is its unique quality. Regardless if it’s for a birthday, anniversary, or Christmas, something different never fails to bring out the ohs and ahs. So instead of a generic photo frame or picture frame, buy tapestries for framing instead. We have great options that you can choose from, in a size that is neither too small nor too big. It’s big enough to be placed on a wall, on a display case, and on a shelf. Where there’s enough room, you can redefine the term ‘personalisation’ by adding framed tapestry instead of just more photos or pictures. 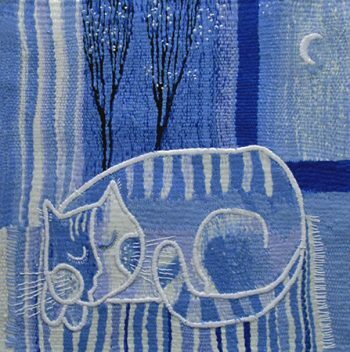 Today we showcase the handmade Wall Tapestries for Framing by Belarusian artist Sergei Saltykov. 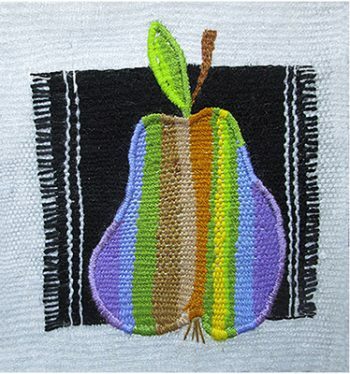 These original small tapestries for framing are designed and 100% handmade by Belarusian artisan Sergey Saltykov. They are made with author’s own and mixed techniques of weaving. The framed wall tapestries are excellent for room décor which create comfort and warmth to your home or office even better than framed pictures thanks to their fabric texture. 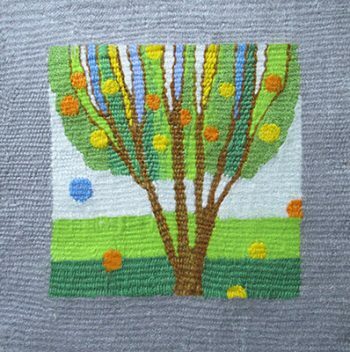 These are the description of some of our tapestries made by the author. Measuring 20 x 20 cm, this beautiful representation of a pear is a testament to Saltykov craftsmanship. Carefully done by hand, you are assured of the amount of work that went into its creation. It doesn’t hurt that the colour palette is pretty impressive. It’s also an eye-opener, of a sort. Who would have thought to mix bright and vibrant shades with black and grey? Well, someone did, and the effect is pretty amazing. To describe this handmade wonder as beautiful is an understatement. Viewed from afar, this 20 x 20 cm tapestry looks like a painting, complete with shadows and light. No one would think otherwise, until close inspection is done. Truly a masterpiece. What usually comes to mind when you think of autumn? Yes, multi-coloured leaves everywhere. But talented artist Saltykov obviously had a different idea, and a unique view of the fall season. 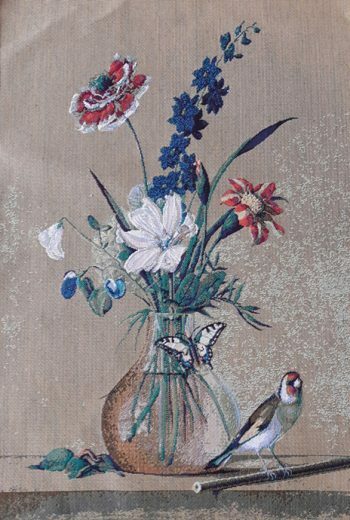 Why not give the gift of visual beauty this Christmas with this wonderful piece? If there’s one thing you can expect from Saltykov’s tapestries, bright colours will be it. 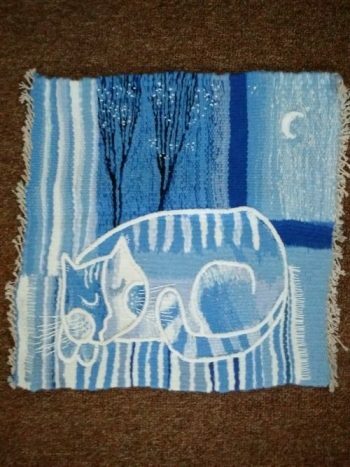 This particular handmade tapestry is sure to brighten any space. Place it next to a black and white photograph, and it will add a pop of colour instantly. Looking at it long enough is likely to calm your mind and give you a visual treat. 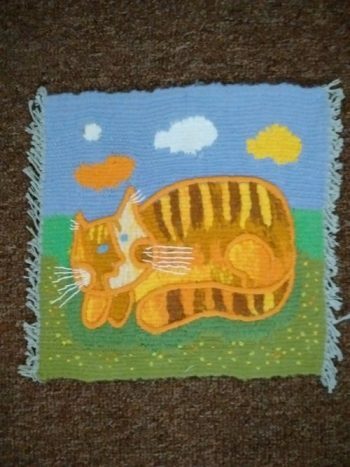 Some more of his beautiful tapestries which we can offer to your attention are the Blue Cat, Yellow Cat and White & Yellow Flowers. Armed with that knowledge, buying tapestries designed and made by Sergei Saltykov as a gift will give a recipient a unique experience and more reasons to appreciate your choice. 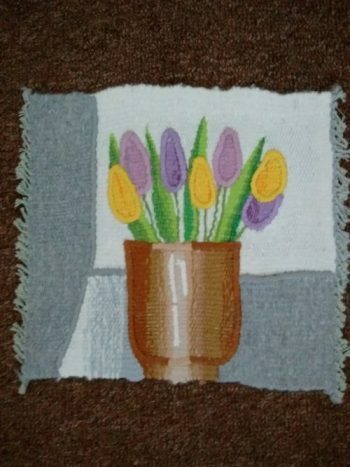 Beautiful wall tapestry of 3 Tulips, measures 20 x 20 cm. 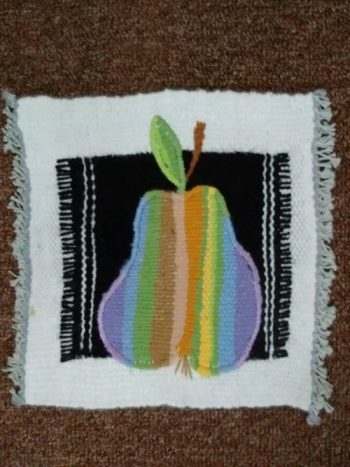 Beautiful Pear tapestry measuring at 20 x 20 cm. 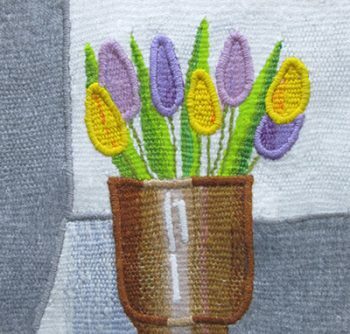 Beautiful Tulips tapestry measuring at 20 x 20 cm. 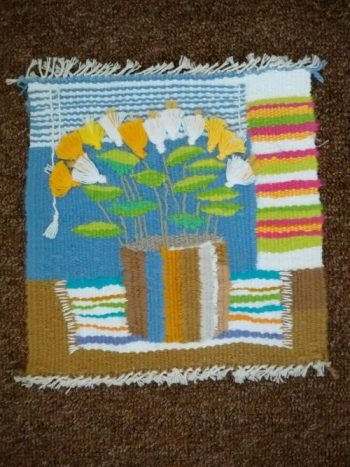 Beautiful white & yellow flowers tapestry measuring at 20 x 20 cm. 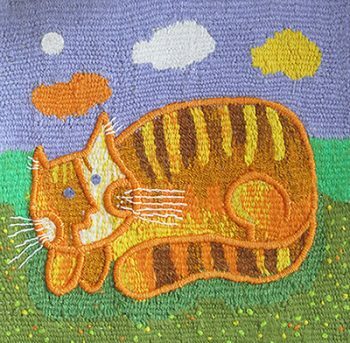 Adorable yellow cat tapestry measuring at 20 x 20 cm. 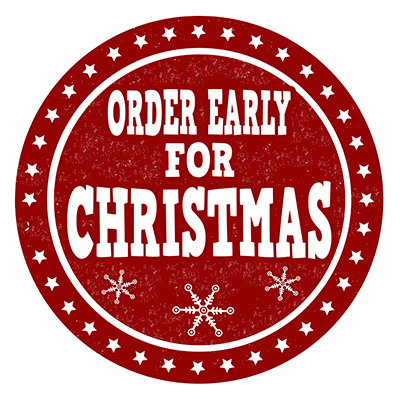 As we approach the end of the year and the Festive period, there comes a time when we need to actually start buying presents, not just noticing them! Of course, depending on who you are buying for, the type of presents that you go for can change totally. I mean, you wouldn’t buy a kid an old piece of art, and you wouldn’t buy your grandfather an Xbox 360, would you? Finding the right Christmas gifts is always very important. Especially in these financially difficult times, it’s hard to find gifts that aren’t just waste of money. Art has, of course, always been a popular choice when buying for adults. 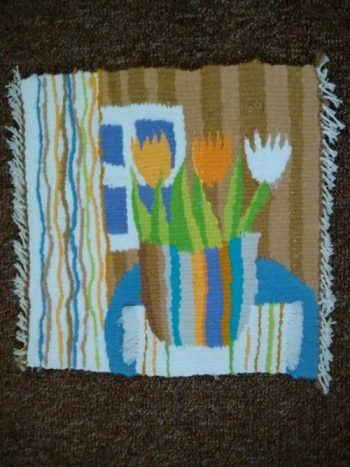 People with their own homes are always looking for something a little bit different for their art collection, and tapestries are perfect for just that. As we all move away from the era of filling our walls with movie and music posters, and towards more traditional art methods, tapestries for framing are the perfect solution. 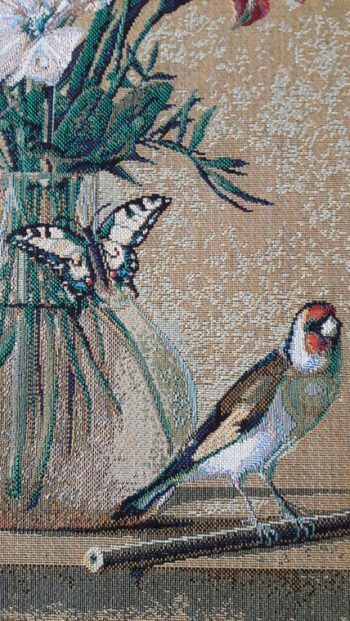 It’s really easy to find a truly sublime piece of art which you will struggle to find elsewhere when browsing through wall tapestries. In terms of finding really unique, powerful art the best place to look is in Eastern Europe. In the last couple of centuries, Eastern Europe has served as a breeding ground for talented artists and they have in turn produced many outstanding tapestries for framing. Tapestries are a textile art, which are usually woven with two interlaced threads running parallel to the length and width of the tapestry. 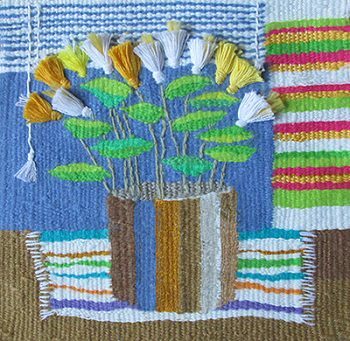 Usually depicting extremely emotional or colourful images, tapestries make a real impact on any home they are placed within. The reason they look so good is that they are not just printed out – they are genuinely woven. If you own a tapestry, there is a high chance it has been made completely unique and from total scratch. The threads tend to be made up of linen or cotton, with silk, gold or silver in the picture to add another level of class. Some of the greatest parts of nature and history have been captured in wall tapestries. For example, this picture of four deer in a forest just sums up the perfection that is nature. Before we brought down the land with our industry, the world looked just like this picture depicts. It’s truly a stunning piece of artistry and would look perfect framed in a sitting room. Tapestries offer a different style and perspective to your usual painting styles, and have commonly been one of the most enjoyable pieces of art you can pick up today. When it comes to finding the right type of art, it’s important to get the real deal and not the quickest alternative. Tapestries are very much the real deal, so why not consider picking some up for the Festive period to really complete the look of your home? They last for many years and offer a significantly higher level of depth and quality than your average paintings! 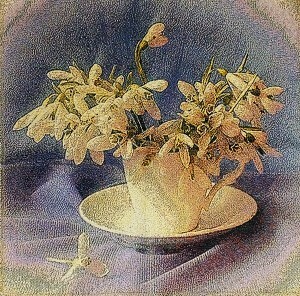 This classic type of art is a form of textile art. Extremely skilled weavers produce majestic art on a textile with ultimate care and diligence to offer you a range of bewitching tapestries. The history of tapestries date back a few centuries. In past, beautiful tapestries were hung in palaces and mansions as a statement of grandeur and wealth. Even after centuries, tapestries are still being able to kindle a flame of opulence wherever it is hung. Decorate the walls of your home with tapestries to invite a cosy feeling and a sense of opulence. Use a tapestry at your office or workplace to impress your clients and employees with status. Never fail to check out our brilliant weaving done by the most skilled weavers in the country. 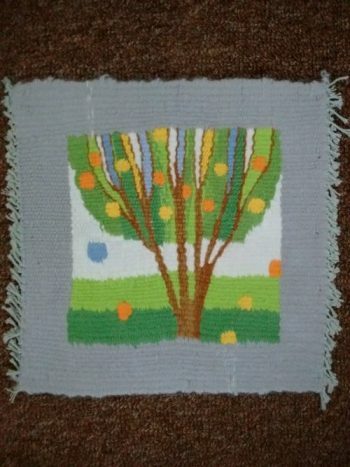 At present, most of the people tend to frame tapestries rather than hanging them on the wall. This increases its life span in multiple folds while retaining its elegance for prolong periods of time. 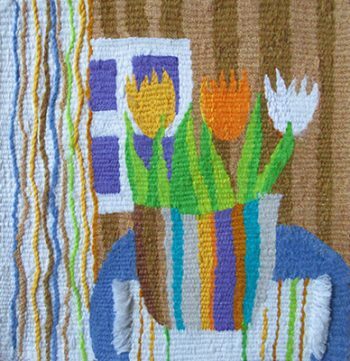 The tapestries we have speak volumes of emotions through their beautiful weaving. 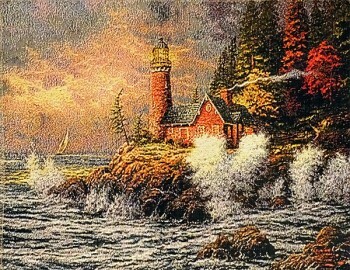 Tapestry of a beautiful scenery with a Lighthouse on rocks measuring at 40 x 29 cm. 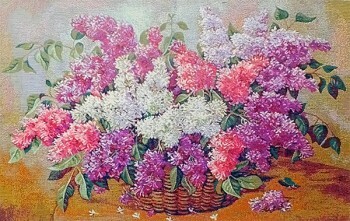 Beautiful lilacs in a basket tapestry measuring at 66 x 39 cm.